A Virtual Assistant, also referred to as VA, is an independent contractor and not an employee. A VA provides professional administrative, creative, marketing or technical assistance specific to the individual VA’s skills to clients remotely from a home office. At Sonia’s Desk, I am a business owner (independent contractor) that offers a variety of virtual assistant services which can be viewed on my Services page. How do I know if Sonia’s Desk is working on my tasks and projects? I am committed to providing the very best service to you as your virtual assistant. It is my number one goal to treat your business like it’s my own. You can count on me to provide the best customer service and quality of work to you and your customers. What if I need services not listed on your Services page? Drop me a note or give me a call. I get requests for tasks I never thought of adding to my list until a client asked. I’m always open to something new. Absolutely! I adhere to a strict confidentiality code and no information will be divulged to a third party. I take your confidentiality very seriously. If I need to use your credit card, I will shred the info after one use. What does Sonia’s Desk charge? Different types of projects have different rates. I have rates for Online Marketing, Podcast Production and Marketing & Administrative Support. For bilingual services, I charge per word. Contact me for rates. 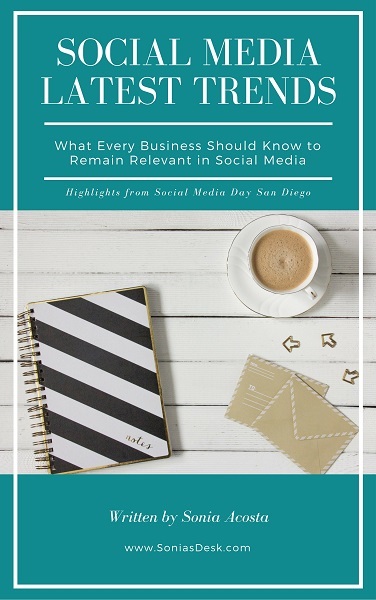 What you need to know today to THRIVE in Social Media!